An essential training course for anyone wanting to carry out non destructive vehicle entry where all keys are lost. Hickleys are the approved Mr Li training centre, we offer professional manufacturer sponsored training. 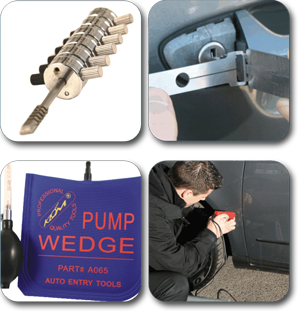 The course reviews "through the door" entry tools such as airbags, wedges and rods and their use. The bulk of the tuition is practical lock picking using the Mr Li range of Lazer and Tibbe picks. Students will be taught the known procedures, systems and rules of opening various locks and instructed on the touch and feel required to best defeat the locks; once picked they can be decoded. Students will start on Tibbe, HU66, HU100, HU101, and then advance onto a variety of different locks depending on their speed of leaning. Auto locksmiths, garage services, recovery companies and anyone that needs to gain entry into vehicles in a non destructive method.